But she has everything. She is everything. And I have nothing to offer her. Except my heart. Sometimes the guy gets the girl, and they live happily ever after. I wanted to be that guy, you know? Especially since I can’t imagine ever loving anyone else. Right after I work up the courage to tell her, my world gets torn apart. My dream becomes my worst nightmare. I wish I could go back in time. I wish I had told her sooner. But most of all…I wish it would rain again. This novel spans Coming of Age, Young Adult, and New Adult genres. A full-length Standalone novel that does contain mature language and some sexual situations, and may also contain some potential emotional triggers. This really was a sweet friends to lovers’ story that showed us how the heart can survive as well as love through extremes of happiness and heartbreak. Dylan and Evie had been best friends for many years. They’d reveled in one another’s triumphs and supported each other through the most heartbreaking life situations growing up. Their friendship had celebrated the best and endured through the worst. Dylan was a beautiful character. If you ever wanted a guy on your side, he was it. Dylan completely stole our hearts. He hadn’t had the best start in life but despite that he was loyal, unselfish and utterly devoted to his loved ones. Dylan had forgone his hopes and dreams to support his brother in running the family Diner, despite having aspirations of his own. Dylan and Jordan’s relationship was one of the highlights for us. These brothers really did share a special bond that was wonderful and moving to witness. Dylan was such a romantic and there were many touches the author added to his personality that only emphasized our feelings towards him. He elicited quite a few heartfelt sighs from us that’s for sure throughout this story. We did enjoy For The Love of Raindrops but sadly it didn’t afford us the heart wrenching emotion we had hoped from such a romantic and tragic story. The reason being that we didn’t really connect to Evie’s character, rather we found her a little one dimensional. We felt as though we knew Dylan personally, and even Nora and Jordan for that matter yet we needed to know Evie on a deeper level which we didn’t experience, despite having her POV every now and then. We found her a little bland which meant that the emotion we should’ve felt was diminished because of that. The supporting characters in this story were fabulous. From Gran through to Nora, each brought a little something extra to the story. 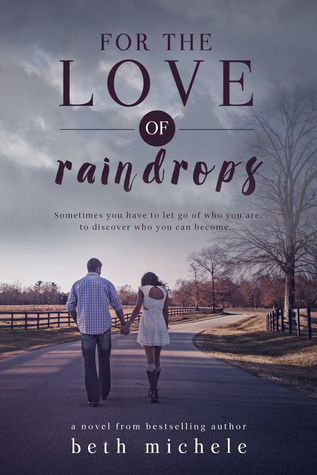 We did feel that For the Love of Raindrops was a tad cheesy in parts, however, there’s no denying that it was a sweet and tender story with some truly beautiful moments. There were passages that had us welling up and the beautiful, sincere moments the author added to Dylan’s character melted our hearts. If you’re a hopeless romantic, then this book will have you swooning .